Never judge a book by its cover. Better yet – just never judge. The couple in this story certainly learnt that lesson fast when visiting Walmart one day. They cruelly made fun of a woman surrounded by her children, assuming she had several “baby daddies”, couldn’t clothe her kids properly and was taking advantage of their hard-earned tax dollars to take care of them. But another woman in line, Lindsay Rae, recognized the woman for whom she actually was: a brand new foster mom, struggling to make sense of the special cards needed to make her much needed purchases. Among those purchases – warm jackets and shoes for the three foster kids she had just bravely and kindly taken on. This story brought tears to my eyes. It made me realize just how brave and giving foster parents are. They are sometimes criticized and accused of trying to make money off vulnerable kids – but we must remember that this is a gross generalization. Just don’t judge. Thankfully, Lindsay gave that couple a piece of her mind that day. And I don’t think they will forget it! Here is Lindsay’s story, which she shared in a powerful Facebook post following the incident. 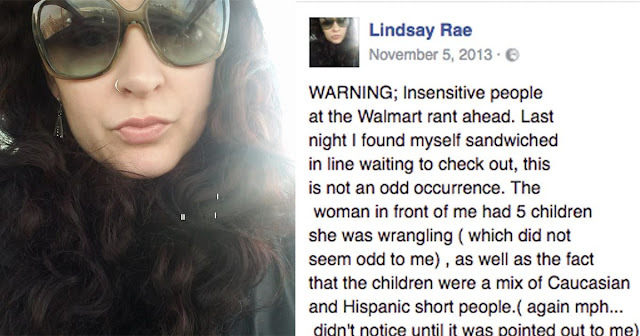 “WARNING: Insensitive people at the Walmart rant ahead. Last night I found myself sandwiched in line waiting to check out, this is not an odd occurrence. The woman in front of me had 5 children she was wrangling (which did not seem odd to me), as well as the fact that the children were a mix of Caucasian and Hispanic short people. (again hmph…didn’t notice until it was pointed out to me). Yes, I said pointed out. I calmed my 3-year-old with old altoids found at the bottom of my purse and looked incredulously back at the well-dressed, normal couple spouting such, well, total CRAP. I looked forward to see a woman fumbling with seperating clothes items; coats and shoes socks and underwear from the food items with the black plastic seperators. There five kids, two that shared her same blonde hair with jackets and warm shoes and three, beautifully dark haired and deep brown eyes, sad, eyes;wearing shorts, and flip flops. It was true she was struggling with a food stamp card. Didn’t know what buttons to use to complete the transaction. I shot them what I can only imagine was the death glare only a mother of 9 can execute to perfection. I showed her how to use her card as the jackholes behind us snorted. I explained to her how she doesn’t have to seperate items and that the items get separated by the computer at check out and how she pays the balance after she runs her card. After they were out of ear shot… I turned with tears to the smug well-dressed man and woman behind me. “Those children? They lost the right to live with their parents just days ago, those clothes? Probably the only clothes they own, or got to leave their home with. THAT woman? Opened her home to kids, kids that needed a safe place to go, when the one they lived in no longer prooved safe enough or secure enough for them. The food stamps? Something health and welfare help an already mother of two feed three new mouths. My new ‘friends’ left my checkout aisle and joined another, silently. I cried hard as I found my Tahoe, buckled the baby in the car, loaded up… and opened those damn M&Ms. You foster mama’s out there… Hold your heads high, you are the hands and hearts that are the strong and the steady for small ones when they need it most. Please share Lindsay’s powerful words with everyone you know to help spread better awareness of the amazing work foster parents do!